Atria/Emily Bestler Books, 9781501190629, 400pp. An unprecedented and terrifying bioterrorism plot threatens to kill millions in the midst of a divisive presidential election in this new thriller from the #1 New York Times bestselling Mitch Rapp series. A toxic presidential election is underway in an America already badly weakened by internal divisions. While politicians focus entirely on maintaining their own power and privilege, ISIS kidnaps a brilliant French microbiologist and forces him to begin manufacturing anthrax. Slickly produced videos chronicling his progress and threatening an imminent attack are posted to the Internet, intensifying the hysteria gripping the US. ISIS recruits a Mexican drug cartel to smuggle the bioweapon across the border, but it’s really just a diversion. 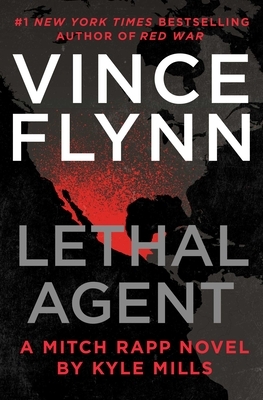 The terrorist organization needs to keep Mitch Rapp and Irene Kennedy distracted long enough to weaponize a deadly virus that they stumbled upon in Yemen. If they succeed, they’ll trigger a pandemic that could rewrite the world order. Rapp embarks on a mission to infiltrate the Mexican cartels and track down the ISIS leader who he failed to kill during their last confrontation. But with Washington’s political elite increasingly lined up against him, he knows he’ll be on his own. “In the world of black-ops thrillers, Mitch Rapp remains the gold standard” (Booklist, starred review). "Outstanding . . . Mills is writing at the top of his game in this nail-biter." "Kyle Mills continues his impressive run of must-read thrillers with RED WAR, a timely, explosive novel that shows yet again why Mitch Rapp is the best hero the thriller genre has to offer. . . and why Mills is the only writer capable of filling the enormous void left by Vince Flynn." "Events lead to a dramatic, you-got-your-money's-worth conclusion. Good, escapist fun." "All action from start to finish . . . a page-turner all the way up to the climatic finale that you just can’t put down."